Snicklefritz! A New Book! Another Grandma In Trouble. 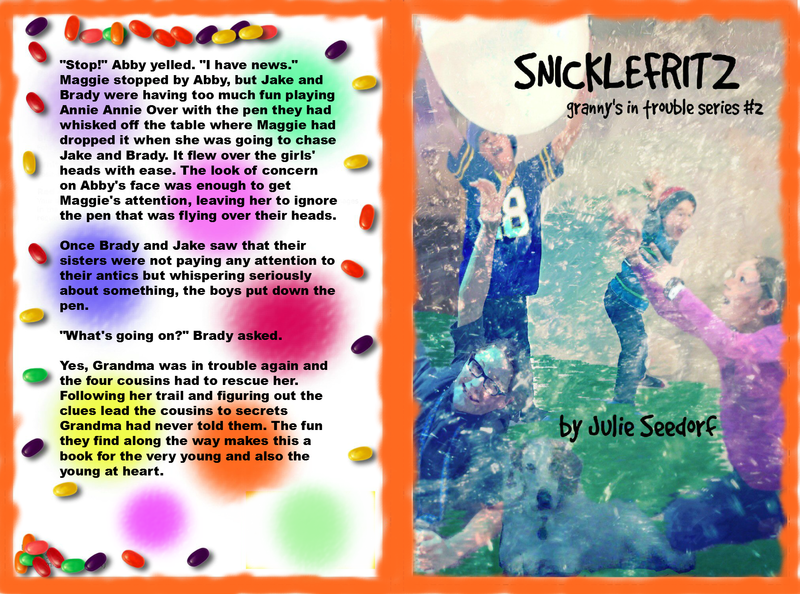 After months of writing and agonizing, my new young reader book Snicklefritz is out on Amazon for the Kindle. The paper back version will be out in a couple of weeks. Yes, this one I published myself. It is in honor of the love I feel for my Grandchildren. I decided to do it myself because I have full control that way. You know how I love control. It is not perfect. I did have it edited but the first time I uploaded it the spacing was wrong, not on my document but something got lost in translation. I hope you will forgive the mistakes if you are older, young at heart, and decide to read it. I hope you can read between the lines and see the love and the heart in this book. I had to go with my gut on this one. It is what it is, a labor of love in honor of my grandchildren. Read on and for those of you that write, write on. Don’t let your fears get in your way. Tags: Author, Cozy Cat Press, Granny Hooks A Crook, Granny Skewers A Scoundrel, Julie Seedorf, Snickelfritz, Whatchamacallit? Thingamajig? Previous Trash or Treasure? What Does Your Computer Measure? Next Roy Rogers Rules, Out of Date or Still In Style?